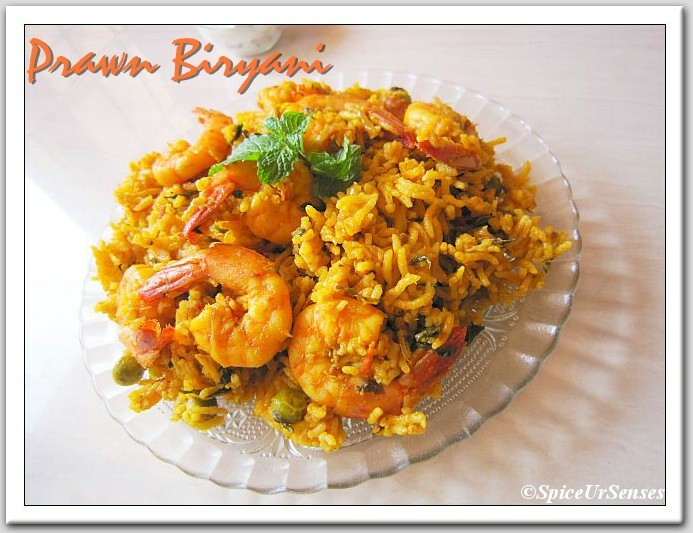 Prawn Biryani.. The delicious and tastiest biryani i have ever eaten. I have become a huge fan of this dish from the day i have cooked. Though it was bite of sweet in taste because of prawns but awesome. You guys must be thinking when ever i cook biryani i always cook in pressure cooker, right!! Let me explain. Cooking in pressure cook is very easy compare to open pot, because it saves lot of time and efforts, and i personally feel it taste good too. You might also like some more recipe's of Prawn. Oil and Salt as per taste. 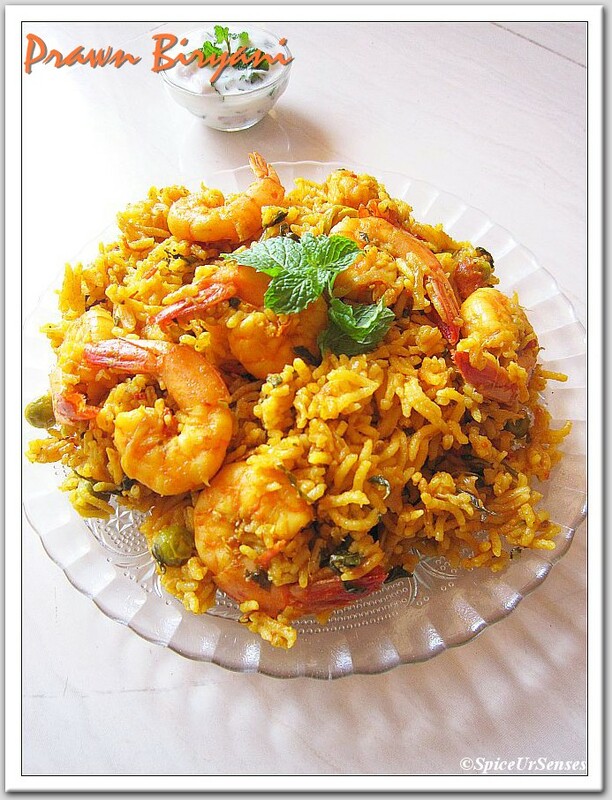 In a large mixing bowl, add curd, lemon juice, ginger garlic paste, salt and prawns, mix it well and keep it the fridge for 30 to 40 minutes. Soak the rice in 1 cup of water for about 10 to 15 minutes with food color. Heat pressure cooker and, add oil, elaichi, bay leafs, and red chilly, leave till it become's brown. Then add onion, green chillies and fry to golden brown. after add all the masala powder and ginger garlic paste, fry for another 10 to 15 minutes. Now add the tomatos and fry till it starts leaving oil. Now add the marinated prawn and rice. Give a good mix and from top add mint and coriander leafs. Add salt if needed. Close the pressure cooker lid and cook for 3 whistle(1 in high flame and 2 in low flame). Serve hot with Raita. Tips: Don't add too much of water. When you are cooking in a pressure cooker. If you are using Basmati Rice. Soak the rice in a water for 10 to 15 minutes before cooking for the best result. Wow. Prawn biryani and that too in pressure cooker! Can it get any better than this--I guess not!! 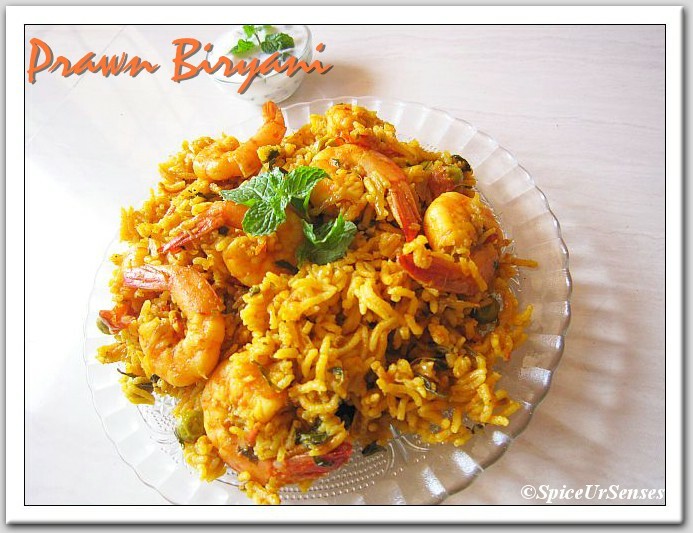 OMG....super tempting and mouthwatering biriyani..
Super flavourful biryani,makes me hungry. This looks perfect and mouth watering delicious. Thanks all for your lovely comments!! Matka MumbaiGet Your Perfect Guessing By Top Satta Matka Online Results Platform.Get More Accurate Information on Satta matka 143 Charts Kalyan Matka with Great Tips and Results. Get Results from Mumbai, Maharashtra, Jabalpur.